Authentication of sports memorabilia is our passion! Our team at Sports Investors is committed to bringing integrity and accountability to the authentication industry. That is why our members thoroughly analyze every item with scrutiny whether it be a jersey, helmet, bat, ball, etc. Submissions undergo multiple independent reviews which are then compared, and receive official authentication only after unanimous approval. Our authentication process incorporates a blend of our expert knowledge with added forensic analysis and photo matching research to not only determine authenticity, but level of game usage as well! 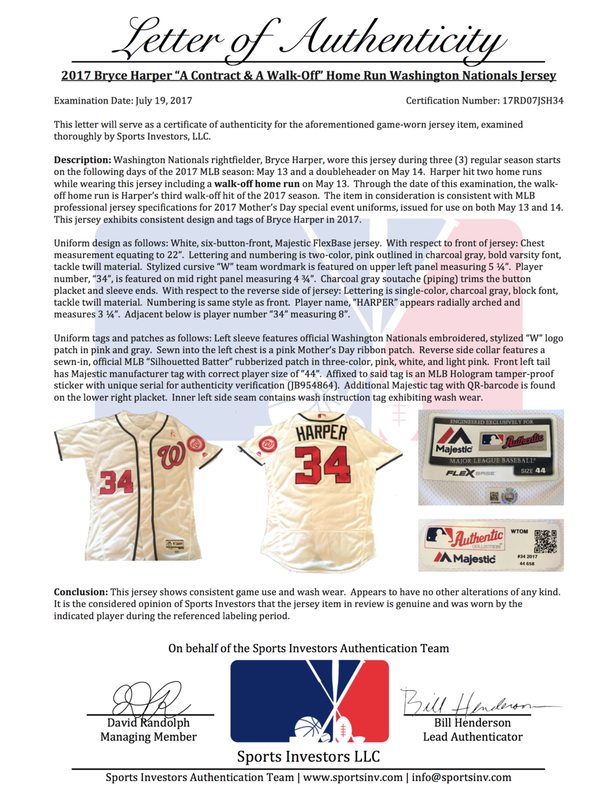 Expertise: Our lead authenticator, Bill Henderson, has compiled what has proven to be the foremost leading reference for MLB jerseys in his Game Worn Guide to MLB Jerseys. Now in its 8th edition, the guide details every jersey style of every MLB team from 1970 through 2017! Sports Investors has an expansive database of diverse exemplars. Final opinion is the result of unanimous approval by our entire team. Forensics: With the cornerstone being our collective expertise and experience (guide and exemplars), our team proceeds with hands-on investigations. The Sports Investors authentication team members analyze memorabilia items by hand with delicate scrutiny. During this process, items are qualified depending on their general and specific characteristics in comparison to the style guide and known exemplars. Generalities include jersey material, styling of numbers, letters, font, etc. Player specifications exhibited on the jersey (sizing, tailoring, peculiar customs like signing jersey tags, etc.) must be consistent, within reason, with exemplars. Photo Match: In many cases, jerseys bear "game worn" designations. However, it is often unknown in what game or how many games the jersey was utilized. That's where our photo matching capabilities come in! As is the case with most professional style jerseys, team logos, names, or numbers are placed and applied by hand. Consequently, each jersey contains unique identifiers that distinguish the jersey from other examples. As it's said, “no two fingerprints are alike", we believe the same could be said of game worn jerseys—no two are identical. We carefully review multiple media databases including photo, video, and interviews from each game. Therein, we can discover identical matches of the jersey under review to the game(s) in which it was worn. We use specialized forensic software to calculate accuracy of the placement of jersey elements, as every jersey is unique. Furthermore, we continue to cultivate positive relationships with professional sports teams across the country. These partnerships provide a final resource to verify and confirm history and game usage of items in review. Read more about how our authentication process brings value to your memorabilia here.